Friday 23rd March saw Wales turn Red to show support for the Welsh athletes competing at the Commonwealth Games in Australia next month. Businesses, schools and cycling clubs all got involved with the Sport Wales campaign and with the first of our Corporate Cycle Networks taking place on that day, it seemed appropriate for us to show our support as proud Welshies and so we asked all those joining us to wear something red. Our first outing of 2018 was sponsored by Stills Branding and cyclists from businesses across the city joined Cyclone24 Directors Zoe Westerman and Steve Sulley for an early morning ride around the Vale of Glamorgan, followed by breakfast at Kin & Ilk on our return. 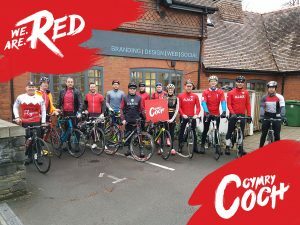 @Cyclone24UK combine networking with cycling – and had organised a special #WeAreRed ride early this morning. 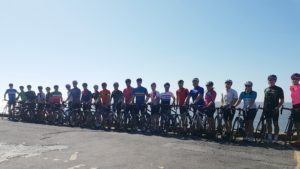 Cyclone24 Corporate Cycle Network takes place once a month, from March to September, with rides typically covering 20-25 miles and a longer ride planned for July.